“Production Division combined rifle and scope MSRP as listed on the company’s website shall not exceed $3,000 USD, the rifle shall not exceed $2,000 USD and the optic not exceed $2,000 USD. 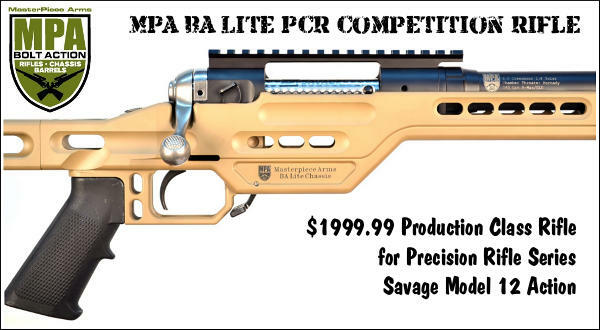 To fit the new Production Class Rules, MasterPiece Arms (MPA) has developed the new BA Lite PCR Competition Rifle built around a Savage Model 12 short action. Designed specifically for the new PRS Production Class, MPA’s PCR Competition Rifle offers many premium features yet stays under the $2,000 Class limit. The Savage action is upgraded with a Rifle Basix 2-lb trigger, and the adjustable, modular chassis offers a bag rider, barricade stop, and even a built-in bubble level. Bipods can be attached up front to a rail, with optional spigot mount. MPA PCR Rifles come with stainless Bergara barrels, 22-26 inches in length, fitted with MPA muzzle brakes (muzzle thread is 5/8-24 TPI). Trigger: Rifle Basix Savage Trigger Set to 2 lbs. The MPA BA Lite PCR Competition Rifle is available in black, burnt bronze, flat dark earth, gunmetal, and tungsten in both left- and right-handed set ups. All chassis and barrels are Cerakoted® in a multitude of colors and patterns. (Custom patterns are $150.00 extra). Barrel lengths available include 22 inches through 26 inches. The barrel twist is caliber-specific and the barrel muzzle thread is 5/8-24 TPI. Editor’s Note: While the MPA PCR Competition rifle has nice features, it’s hard not to compare it to the Ruger Precision Rifle costing hundreds less. The latest Gen 2 Ruger Precision Rifle, with a sleeker handguard and factory muzzle brake, is available for under $1500.00 “street price”. Ruger lists a $1599.00 MSRP for the Gen 2 RPR versus $1399.00 for Gen 1 models. Two pounds has gotten lost in order to make the chassis workable for these competitions. I’ve built some rifles using this chassis from the factory and they have been heavy obviously. This new competition model should be a little more portable. Ruger barrel vs Bergara barrel: BERGARA EVERY DAY. Not only that, but it comes with a muzzle brake, whereas the RPR does not. It also offers a longer bipod wheelbase, which is helpful. It should be interesting to see what the final street price is.